Test methods for assessing the ignitability of covers and fillings used in upholstered seating, by smouldering and flaming ignition sources. This British Standard describes methods for assessing the ignitability of single material combinations, e.g. covers and fillings used in upholstered seating, or complete items of seating, when subjected either to a smouldering cigarette or to flaming ignition sources of thermal output ranging from that of a burning match to that approximating to the burning of four double sheets of full-size newspaper, as might be applied accidentally to any item of furniture. Possible ways in which the standard can be used either to indicate the potential ignitability of components in conjunction with other specified materials or where more specific information is required about design features are given in an annex to this standard. This British Standard supersedes BS 5852:1990, which is withdrawn. BS EN 1021-1, BS EN 1021-2.
any test specimen that, on final examination, shows evidence charring within the filling more than 100 mm in any direction, apart from upwards, from the nearest part of the original position of the source. any test specimen on which any flame front reaches the extremities of the specimen other than the top of the vertical part of the test specimen or passes through the full thickness of the specimen within the duration of the test. However, more drastic requirements have been set in force by the Furniture and Furnishings Fire Safety Regulations 1988 (Statutory Instrument 1988 No. 1324, PART I: Ignitability test for polyurethane foam in slab or cushion form). In addition to pass fail criteria of BS 5852: 82, weight loss of polyurethane foam in slab or cushion form in the ignitability test is limited to 60 g when testing with the ignition source n° 5. Also note that if failure against the criteria of clause of BS 5852 part 2 has occurred but only by way of damage exceeding the limits and provided that the resultant mass loss (initial mass less final mass) is less than 60 g, the foam passes the ignitability test. At the European level, standards based on fire assessment function of fire hazards applications are in progress (EN 1021 for upholstered seats and EN 597 for mattress). 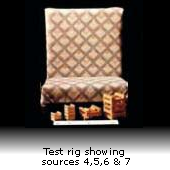 Methods of test for assessment of the ignitability of upholstered seating by smouldering and flaming ignition sources. Introduction to BS5852:1990: This document contains the test method and flammability requirements for upholstery composites exposed to ignition sources 2 to 7. Each ignition source has twice the calorific output as the one preceding it. Sources 2 & 3 are butane flames (each of greater calorific output than that of the match source described in BS5852:1979). Sources 4 to 7 are wooden cribs ranging in weight from 8.5 grammes (crib 4) to 126 grammes (crib 7) and are illustrated opposite. A wooden Crib 5 ignition source weighs 17 grammes (+/- 1 gramme) and is composed of 20 sticks of Scots Pine (Pinus Silvestris). In the UK, this is the most frequently used ignition source for testing fabric used in contract furniture. The test rig used is shown below where a crib 5 test is being conducted. BS5852:1990:Source 5 Procedure: Cover fabric is secured over filling material constituting the seat and back of a small "chair". The test fabric dimensions are 1100mm x 650mm (length x width). Prior to testing, all fabric and filling material is maintained in an air conditioned environment (in which both temperature and relative humidity are controlled) for a specified time. The tests are also conducted within specified temperature and humidity ranges. The ignition source is placed in the centre of the rig. 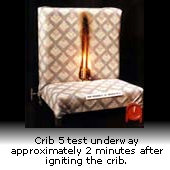 Events occurring after crib ignition are recorded, e.g. time to fabric ignition, cover split, flame extinction. Once all flaming ignition has ceased, the filling material is examined for damage. The test method describes limits to length of time the assembly may burn and to the extent of damage that may be sustained by the filling. The test assembly is assessed against these pass/fail criteria and thereby judged to have complied or failed to comply with the test requirements. Each test is conducted in duplicate. Both replicate test assemblies must satisfy the pass/fail criteria in order to comply with the test requirements. Filling Material: Ideally, the filling material used in the test should be the same as that used in the finished item of upholstery. In practice, fabric suppliers are unlikely to know what filling material the cover fabric will be used with when the furniture is made up. As a consequence, we conduct most Crib 5 tests using CMHR foam with an approximate density of 35 kg/cubic metre. The filling depth is 75mm. any specimen that displays escalating smouldering combustion so that it is unsafe to continue testing and requires forcible extinction. any specimen that smoulders until it is consumed or that smoulders to the extremities of the specimen. escalating flaming combustion where it becomes unsafe to continue testing and requires forcible extinction. any specimen which burns until it is consumed within the test duration. any specimen where the flame front reaches the specimen extremities (other than the top of the vertical part) or passes through the full thickness of the composite. any specimen that continues to flame 10 minutes after igniting the crib.